I’m writing this on Saturday — I leave for vacation tomorrow. Well, workcation. This is a non-pagan post, but I wanted to get it out there because it’s taken months of searching for me to find a strategy that works. All credit goes to this forum post, technothrillerben. I have not written about Scrivener before, but Scrivener is an awesome creative writing and project management writing app that is available for Mac, Windows, and Linux (experimentally). It will hopefully soon be available for the iPad, but until then, we have to make do with workarounds. I am currently trying to write a non-fiction novel about Goal Setting using Wicca; and I’m also working to edit a few novels that I’ve got kicking around. I’ve got a few novels published under a different name (here, here, and here), and I’d appreciate you checking them out, but that’s not the purpose of this post. The purpose of this post is to tell you how to use Scrivener on your iPad. Okay, so first things first. You need Dropbox (it’s free), and on your iPad, download Plaintext — it’s also free. Then, in Plaintext, link to your dropbox. You might also need to download Dropbox for iPad, if you haven’t. Okay, now that you have a Plaintext folder in your dropbox, open up Scrivener. Go to File—>Sync —> To external folder. In the “which folder should you sync to”, sync to the plaintext folder, but create a folder for your project (I always have more than one). Select the option to sync everytime you open and close the project, and make sure you’re syncing in Plain Text, not RTF. Then sync, and you’re done! I wanted to share this with you guys so that you would be informed. I don’t have too much to say about it, except that these people went out of their way to be ignorant about our faith. I’m not sure Fox News could even be a forum where religious tolerance and education would be well received. I’m not sure that getting up in arms about this would be helpful. I sort of see it as a lost cause. I welcome Fox News commentators and anyone else who is interested in learning what Wicca is to check out the 13 Principles of Wiccan Belief. Also, I want you to know that if you’re Wiccan and/or Pagan, it is your right and privilege to ask for your holidays off from work or school. I have done it in the past without a problem. I believe you can pursue legal action against your employer or University for discrimination if they deny you a reasonable request for time off. I say “reasonable” because I don’t think it’s reasonable to request 13 esbats and 8 sabbats off from work, then spend the days at home, playing video games. If you have a special holiday ritual you want to do, then by all means, request the day off of work. Most of the time, you probably won’t even have to tell your employer (if you don’t want to) that it’s a religious observation. Imagine losing a quarter of your work week to a migraine. Let’s say you go home to try and prevent it from getting worse. You take a nap, and you wake up feeling better. But then you can’t sleep that night. So you’re tired the next morning, and lo and behold, by noon? You’ve got another migraine. Imagine this cycle going for weeks. Years, even. Imagine trying crazy diet, sleep, lifestyle changes. Saying no to concerts, and amusement parks, and conferences because you’re afraid that they’ll end in misery. How long has it been since you took pain medication? And, how long have you gone between taking medications? The answer, for me, was two or three days to about a week. That’s right. I couldn’t go a whole week without popping an Imitrex, or an Excedrin Migraine. And I bet, if you’re a migraine sufferer like I am… neither can you. In the beginning of February, I decided to stop. I had been pouring over websites to find a neurologist, a different doctor, so that I could find some miracle drug that would cure my pain. And one of the forum posts I found, someone said that they went to an EXCELLENT doctor, and that doctor made all of her patients detox from pain medication before she evaluated them and prescribed new drugs. She would offer Magnesium I.V.’s… but that’s about it. So I called that excellent doctor and tried to get an appointment. According to the receptionist, they were scheduling new patients 9 months from now. And I’d need a referral. Being stonewalled like that made me think hard. I couldn’t live another 9 months “out of control” like this. I’d had new symptoms, more… mental, symptoms, recently, and they scared me. My eyes got blurry and I couldn’t read, at one point. Oh, and I forgot a friend’s name. Like, I checked email, a staff directory, facebook and my phone to make sure that the face and name were the person I wanted, because the name sounded… strange, to me. And I thought about what that “EXCELLENT” rated doctor would tell me to do, and I realized that I needed to detox. It was not fun. I had a Thurs-Tues migraine, varying in intensity from 2-6 (on a 1-10 pain scale). I lost a bit of time at work — thankfully, mostly afternoons. But since that “detox” headache… I haven’t had an outright migraine. Symptoms, yes. But, instead of medicating, I’ve just loaded up on water and had some downtime. I’ve found that I have an almost everpresent dull ache. It’s “for” different things at times — sometimes, it’s because I’m constipated or under other stomach distress. Sometimes, it’s because I’m stressed. Sometimes, it’s because I’ve had poor posture and I’m getting a sore neck or tension headache. But the dull ache isn’t the end-all beginning to the migraine anymore. When my body was addicted to pain killers… it was. If I had a dull ache and ignored it or didn’t go home immediately… nine times out of ten it turned into a migraine. I’m not saying that I’ll never take the drugs again. I’m traveling next week (sorry, friends!) and I’ll probably be popping Excedrin Migraine like candy during the 12 hour a day conference I’m going to. But, I’ll certainly try “downtime,” first. I’ll try hydrating, or using my glasses, or stretching. I think that, when you remove the option of drugs from the pool of treatment ideas… your migraines can become more manageable. Mine have. Brightest blessings to you guys. As I said, I’ll be away for a week, and I’ll have minimal access to the interwebs. So, expect a post from me in March. Hello, all. For those of you who follow me for my awesome opinions… this is not a post that contains those. Rather, I’m working on expanding the material I’ve got indexed here on “Beginning Practice” and I want to have a standard circle cast and close available for interested people. I will get you a life update and maybe some interesting reflections later this week. I promise. Prepare ritual space by setting up altars, placing lighters, etc. When ritual space is ready and all materials are where they need to be, exit the room to cleanse yourself. Take a bath or shower, ground, and center yourself. When you are ready, return to the ritual space and begin. Take up your water-bowl and hold it to the sky. Set the water-bowl down, and pick up your salt-bowl, raising it to the sky. Take a pinch of salt with your athame and add it to the water bowl, stirring three times deosil if the moon is waxing, and widdershins if the moon is waning. Traverse the circle in the appropriate direction with the salted-water, sprinkling around and within the circle to cleanse the area. At the end, sprinkle some of the water on yourself, too. Take up and light the incense. Traverse the circle in the appropriate direction with the incense, wafting the smoke around and within the circle to cleanse the area. When you have returned to center, waft some of the smoke over yourself, too. Place the incense down and pick up your athame. Return to the eastern gate, and traverse the circle clockwise, drawing the circle with your athame. Light your center (spirit) candle. After you are done meditating and doing any other prayer work or crafts you desire, you can close the circle. Go to the center altar. Draw the spirit banishing pentagram with your athame (start at top point, go counter clockwise). Move to the east. Draw the eastern banishing pentagram (start at center right point, go counter clockwise). Move to the south. Draw the southern banishing pentagram (start at lower right point, go counter clockwise). Move to the west. Draw the western banishing pentagram (start at lower left point, go counter clockwise). Move to the north. Draw the northern banishing pentagram (start at center left point, go counter clockwise). Return to the east, and slice the circle with your athame. What Is A (Magic) Circle? What is a circle, exactly? A circle is a sacred space, much like a church, that one uses to connect with, cajole, and control supernatural forces. Traditionally, it is large enough to contain all the materials and people needed for the ritual. When you draw a circle, it not only has visible boundaries — by way of chalk, or altars, or element candles — but also invisible boundaries which extend above and below the plane that you’re standing on (the floor). So technically, a circle is a sphere of sacred space. Where did circle casting come from? Circle casting has its origins in high and ritual magic, which most notably “came of age” in the late 1800’s to 1900’s. Sparing you a whole history of high magic — although Ronald Hutton’s The Triumph of the Moon is an excellent resource — suffice to say that circle casting comes from a long and storied history of secret organizations, mystical books, and eccentric people. There are two ways to approach interacting with supernatural forces: commanding and requesting. The origins of circle casting suggest that we must command the supernatural forces, and indeed, many high magic books and rituals include special words, symbols, and tools to do just that. However, you can see in the language of Wiccan ritual that we are right down the middle. We often “command” the elements, but “pray to” or “request of” the gods. What are the benefits to casting a circle? Hands down, the number one benefit of casting a circle is focus. By engaging in formal, organized ritual, you are more likely to invest time and energy into the changes that you are trying to make. This benefit excludes any supernatural investment or intervention: rather, it is your commitment that makes a difference. When you take the time to organize your words and actions, they become more powerful. We can see it also in the “real world” — television is almost always scripted, and when it is not, even improvisation follows structure. Poetry and books abound — you’re reading an organized thought right now! The other benefit of a circle is in the circle casting words itself: a circle is a “container to hold the magic raised within.” Or something similar, depending on what tradition you cast in. A circle contains, and amplifies the power that you raise. Whatever the reason you cast a circle, be sure to do it with a clear mind and heart. I am all about making delicious food easy. It’s not that I don’t have a lot of time to cook, although sometimes, I don’t. And it’s not even that I just hate cooking — I do enjoy taking time to prepare food for myself. It’s more that sometimes, I want to get in and out of the kitchen as quickly as I can. Maybe there’s a show on that I want to watch, or singing I want to do, or even, work to go to. So here’s the trick. This is “super easy” because we’re adding cooked chicken. Therefore, we only need to pick some spices, prep the veggies, then add the chicken. If you don’t have pre-cooked chicken, this will not be super easy. You’ll also have to cook the chicken. 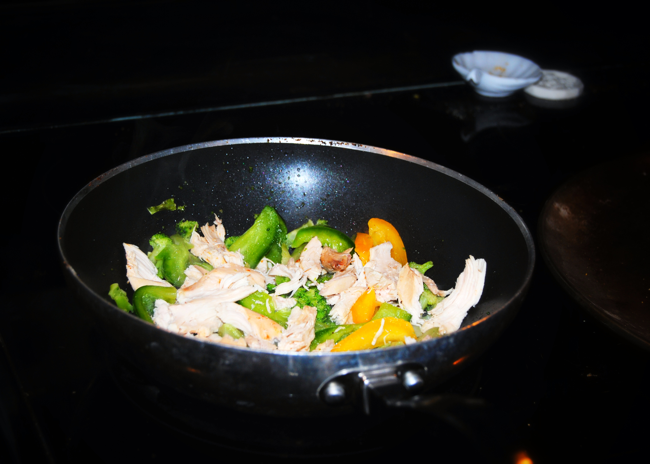 In this picture, I used hand-torn rotisserie chicken, frozen bell peppers, and freshly sliced onions (but I don’t think you can see any of those… they seem to be caramelizing on the bottom of the pan). For fajitas, I generally use the “that looks like enough!” method of spice-adding. I like to add garlic powder or fresh minced garlic, tons of it… some onion powder if I don’t have fresh onions, some chili powder, some red cayenne pepper (more if it’s just for me… I LOVE that heat! ), and some salt and pepper. Basically, get your veggies ready, and throw the onions and garlic into the skillet first, along with some pre-heated oil (I use coconut oil). That means, heat the oil, add the veggies. Let the onions cook for about five minutes on medium heat — until they start to crisp on the edges or become translucent — before you add the peppers. When you add the peppers, you’re looking for a nice, crispy brown look on a few of them, and they should start to become soft. That’s maybe another 3 or 4 minutes. When your veggies are ready or almost ready, add in your torn up chicken and all of your spices — cover and let the entire dish warm for a few minutes and get the spices nice and mixed in. When it’s all hot and bubbly, enjoy! I’m doing primal food right now, so I probably would not use a flour tortilla. I would just eat it straight off of a plate. It’s just as delicious. I promise. Take yesterday, for example. My boyfriend has been having car troubles, so we’ve been sharing my car. When he works early in the morning, I have to wait until the afternoon to go to work — which is fine, I have a flexible schedule. But part of me cringes and shouts “SLACKER!” whenever this happens, because I’m strolling into work around noon. But, when I got here, I pretty much ran errands and got little things done for the full three or four hours I was present. Today, my boyfriend has to work 7 to 2. I could not justify going into work at 2 or 3… so I hopped a ride in at 6:50. It is now close to 11, 4 hours later, and I haven’t done a damned thing except browse Cracked.com, take a few walks, and generally waste time. Oh, I ate breakfast. And took a short snooze. It makes me think that I would almost be a more productive employee / researcher if I just came in from 11-4:30 everyday, took my hour lunch, then worked. Mornings and me doing thinking work just don’t agree. Not a very spiritual post, but, they can’t all be!